If you are looking for some friendly competition and good exercise, check out all the sports and games you can play in Cape Coral's parks. The following activities can be done in a variety of park locations at your leisure so grab a couple friends and/or family members and come out to play! If you are looking for details on organized sports offered in Cape Coral, such as softball and flag football, visit the Athletic Division home page and Community Athletic Organizations. All of the parks listed below have outdoor basketball courts which are available for the public to use from sunrise to sunset at no charge. They may be utilized on a first come, first serve basis, but please be courteous and restrict your time when others are waiting to use the courts. * Jim Jeffers Park is lit until 9pm daily, so people playing basketball at that location are permitted to use the courts until the park closes. In addition to the above outdoor basketball courts, the Cape Coral Parks & Recreation Department owns and operates Oasis Gymnasium which is located adjacent to the Oasis Charter Schools. Outside of regular school hours, the two (2) full-size, indoor basketball courts located within the Oasis Gymnasium are utilized by the Athletic Division of the Parks & Recreation Department to run adult and youth leagues as well as tournaments. Please note that Oasis Gymnasium basketball courts are not available for public use. For information about basketball programs offered at Oasis Gymnasium through the Athletic Division, call (239) 573-3128 or visit the Athletic pages of the website by clicking HERE. The park is open daily from sunrise to sunset UNLESS there is a scheduled AND permitted activity. You must provide your own equipment. Please note: Several leagues utilize these courts on a regular basis and no private play is permitted during league play. The bocce league schedules are posted at the courts, with open play available most afternoons until 4:30 p.m. If you are interested in league play, there are several local bocce leagues and associations available including the Cape Coral Bocce Association, Goodfellas Bocce League, Italian American Bocce League, and Women’s Cape Coral Bocce Association. To view current contact information for these various organizations, visit the Park Community Group Directory. Although people are not permitted to hit golf balls in the majority of the City’s parks, Coral Oaks Golf Course is a beautiful, Arthur Hills designed 18-hole, Par 72 championship course which is owned and operated by the Cape Coral Parks & Recreation Department. Large TifEagle greens, combined with contoured fairways, 8 lakes, and 37 bunkers make the course challenging, yet entertaining for golfers of all skill levels. Coral Oaks Golf Course also includes a large driving range and short game practice area, well-stocked pro-shop, Knickers Pub, which offers a diverse menu and full bar, and onsite PGA instruction. Rental clubs are also available for a nominal fee. For more details and current rates, visit www.CoralOaksGolf.com or call the course at (239) 573-3100 to book tee times up to 7 days in advance. Cape Coral has a few parks where you can play horeseshoes and/or shuffleboard. There is no charge for the use of these regulation sized courts; however, you must bring your own equipment to play (with the exception of the Yacht Club Pool where you can borrow shuffleboard equipment for free during the pool’s normal hours). The courts/pits may be utilized on a first come, first serve basis, but please be courteous and restrict your time when others are waiting to use them. *This location also offers league play. For more information, you may contact the Saratoga Lake Homeowners Association at (239) 772-9395. Shuffleboard equipment is available to borrow from the pool gatehouse office free of charge during the pool’s regular hours of 10 a.m. to 5 p.m., 7 days a week from March-September, or Wednesday through Sunday from October-February. While skateboarding, rollerblading and riding scooters is not permitted in most public areas within the City, Eagle Skate Park offers a great venue for children of all ages to engage in these high energy activities in a safe and fully supervised environment. Eagle Skate Park, which is located adjacent to the William “Bill” Austin Youth Center on SW 2nd Ave, is one of the largest skate facilities from Miami to Tampa featuring nearly 27,000 square feet of ramps, rails, street obstacles and a bowl. Get more details about Eagle Skate Park, including hours of operation, admission rates, and directions to the park by calling (239) 574-0490 or clicking here. Sun Splash Family Waterpark: Sun Splash includes over 14 acres of exciting tubes, tunnels, slides, pools and fun for all ages. This regional water park is open seasonally March through September and is a perfect place to beat the heat and make a splash. The park offers daily admission, season passes, birthday parties and group outings, plus learn to swim, junior lifeguard, and water safety programs every summer. For more information and hours of operation, visit SunSplashWaterpark.com or call (239) 574-0558. Yacht Club Beach: Located within the Yacht Club Community Park, the Yacht Club Beach is the only swimming beach in Cape Coral. This public beach is open from dawn to dusk; however there are no lifeguards on duty so those who wish to go in the water should understand that it is a "swim at your own risk" beach. Yacht Club Community Pool: Also found within the Yacht Club Community Park, the Yacht Club Community Pool features a heated Olympic size pool and kiddy pool with interactive Dewdrop fountain and underwater bubblers. Fully trained lifeguards are on duty during the pools operating hours, and various aquatic programming is offered throughout the year including water aerobics, swim lessons, junior lifeguard camp, synchronized swimming, and special events. Daily admission or a season pass is required to use the Yacht Club Pool, and this facility is also available for parties and private rentals. for more information, call (239) 542-3903. Please Note: Alcoholic beverages are not permitted in Cape Coral's swimming areas, parks, or on the beaches. 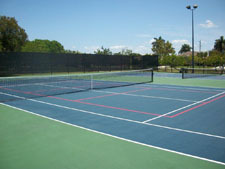 If you enjoy racquet sports, Cape Coral has several parks with outdoor tennis courts, parks with dual use tennis/pickleball courts, as well as one location with outdoor racquetball courts that are available for public use. Players are responsible for providing their own equipment at all facilities. The Yacht Club Tennis Courts located on the grounds of the Yacht Club Community Park, is the City's primary tennis facility and includes five (5) lighted asphalt tennis courts which are open to the public from 8:00 a.m. until 9:00 p.m. Monday though Friday, and from 8:00 a.m. until 5:00 p.m. on Saturday and Sunday. At this location, a tennis pro staff is available for both private and groups lessons as well as league play, and a pro shop is located on-site which offers tennis shoes, equipment, and racquet stringing during regular operating hours. Annual memberships can be purchased to utilize the Yacht Club Tennis Courts or non-members can enjoy the facilities by paying a daily fee for court time and/or participation in organized tennis activities. For more information about activities offered at the Yacht Club Tennis Courts or to reserve a court during open play, call (239) 574-0808. For those who are not familiar with the latest sports craze, pickleball is a sport that is similar to badminton, tennis and ping pong, but has its differences. It is played with a hard paddle and a polymer smaller version of a wiffle ball on a court that is similar to a doubles' badminton court. Because this game is easy to learn and less strenuous on aging joints than tennis, pickleball courts have been popping up throughout Lee County to help accommodate the increasing demand. Options for creating these courts include adding different colored pickleball lines to existing tennis courts for a reduced court size (joint use), converting seldom used tennis courts into pickleball courts, and constructing stand alone pickleball courts. The City of Cape Coral has added pickleball court lines on the existing tennis courts at Burton Memorial Park, Camelot Park, Jim Jeffers Park & Joe Stonis Park. While the courts are available on a first come, first serve basis, please be courteous by limiting your court time to one hour when others are waiting. Think it's too hot to play outside? Try playing indoor pickleball in air conditioned comfort on the portable indoor court at Four Freedoms Park (4818 Tarpon Court)! Four Freedoms offers court times througout the week at a cost of $5 per person (maximum of 4 players at a time) to reserve 2 hours of playtime. Paddles and balls are available to borrow or you may bring your own. For reservations, call 239-574-0804. For more information on the history and rules of pickleball, visit the USA Pickleball Association website at www.usapa.org. For those who enjoy playing racquetball, there are two (2) outdoor, open-back racquetball courts located adjacent to the Tony Rotino Center on the grounds of the Yacht Club Community Park that are lighted and open daily until 9:00 p.m. These courts are free for the public use and available on a first come, first serve basis; however, please be courteous and restrict your time when others are waiting.